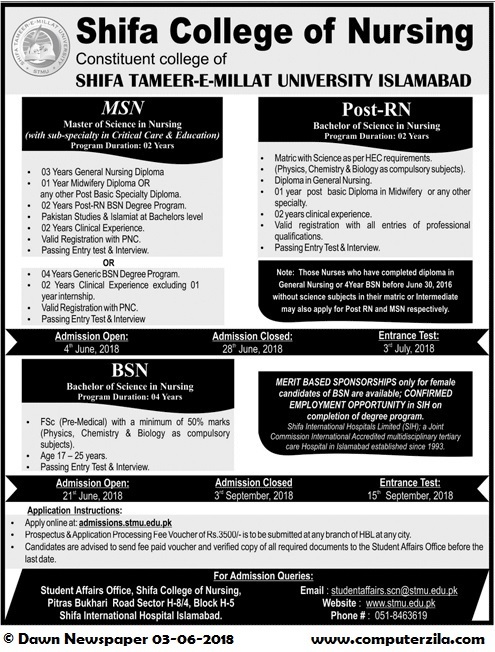 Admissions Open at Shifa Tameer-e-Millat University's Islamabad Campus for the batch Fall 2018. STMU offers admissions in different fields of study for Bachelors, and Masters. you can apply for BS - Bachelor of Science, MS - Master of Science, . University Address Student affairs office, Shifa College of Nursing, Pitras Bukhari Road Sector H-8/4, Block H-5, Shifa International Hospital Islamabad.